I’m for free trade because I want more jobs and more prosperity for the United States. Indeed, I’ve argued we should copy that incredible economic success of Hong Kong and Singapore by unilaterally eliminating all trade barriers. But some people complain this is akin to disarmament in a hostile world. I reject that analogy. If my neighbor shoots himself in the foot, I’ve never thought I should “level the playing field” by also shooting my foot. That being said, we all should agree that the ideal scenario is for nations to adopt free trade agreements in order the maximize the economic benefits for all consumers and businesses. And the good news is that nations have been building on the multilateral success of the WTO by also adopting free trade agreements. The United States, for instance, has 14 FTAs that govern trade with 20 nations, most notably NAFTA. And while I grouse about some of the E.U.’s statist tendencies, there is genuine free trade among member nations. But there is some bad news. Politicians and bureaucrats are slowly but surely hijacking FTAs and undermining their pro-growth impact with red tape. It’s become so much of a problem that some free traders are questioning whether the current approach is worthwhile. For example, Iain Murray of the Competitive Enterprise Institute explains why he isn’t losing any sleep about America backing out of the Trans-Pacific Partnership. The Trans-Pacific Partnership is an example of why free trade came to have such a bad reputation with the American public. Rather than a simple agreement to lower tariffs for mutual benefit, it morphed into a massive international regulatory regime over 5,000 pages long. It was weighed down by numerous non-trade provisions aimed at appeasing non-trade special interests. …the TPP went down the road of regulatory harmonization. He makes sure to point out that the TPP may still have been worthwhile when using cost-benefit analysis. This is not to say that…the TPP’s tariff reductions would not have outweighed the regulatory burden. But he argues that a much better approach is FTAs based on regulatory competition. …there is an alternative to 5,000 pages of regulatory harmonization. …regulatory competition may be a better solution than harmonization… Regulatory competition works best by mutual recognition. For instance, Australia and New Zealand have formed a single economic market based around the Trans-Tasman Mutual Recognition Agreement, whereby…Goods legally sold in one country can be sold in the other. This principle operates regardless of different standards, or other sale-related regulatory requirements between New Zealand and Australia. …Such an agreement would probably work very well between the U.S. and Canada – and, indeed, between the U.S. and both Australia and New Zealand in the Trans-Pacific context. …Australia, New Zealand, Canada, Chile, Singapore, and Hong Kong…A series of mutual recognition agreements with these former TPP countries would effectively form the nucleus of a Global Free Trade Association. I would add the United Kingdom to Iain’s list (assuming it manages to extricate itself from the European Union). Indeed, just yesterday I submitted a comment to the United States Trade Representative on a proposed FTA between the U.S. and the U.K.
Here’s some of that analysis. A trade agreement between the United States and United Kingdom would be a chance to increase prosperity in both nations by eliminating all forms of trade barriers… It’s also an opportunity to refocus trade agreements in ways that recognize sovereignty and promote pro-market policies. More specifically, a free trade pact between the U.S. and U.K. would offer a much-needed opportunity to discard the clutter of exceptions, long phase out periods, and non-trade issues, which has characterized recent agreements, and instead go with a cleaner approach that would allow the simplicity of unfettered commerce. The ideal trade pact should seek to make trade between the U.S. and the U.K. as simple as trade between New York and Pennsylvania. That type of trade agreement doesn’t need to be cumbersome and doesn’t require a detailed thousand-page document. I give my two cents on the benefits of mutual recognition and the value of reorienting FTAs in a pro-market direction. …such a pact should be based on the principle of “mutual recognition,” which means that nations can have their own laws governing economic activity inside their borders, but they recognize that other nations have the same right. Most important, they also agree that there should be no restriction on the ability of consumers to buy from producers in the other nation(s). …Under such a regime, a company in the U.S. wouldn’t have to produce separate products for U.K. customers since there would be no policy restricting a consumer in, say, London, from buying a product made in, say, Cleveland. …A pact for free and open trade between the U.S. and U.K. could become a new role model for agreements between industrialized, high-income nations. 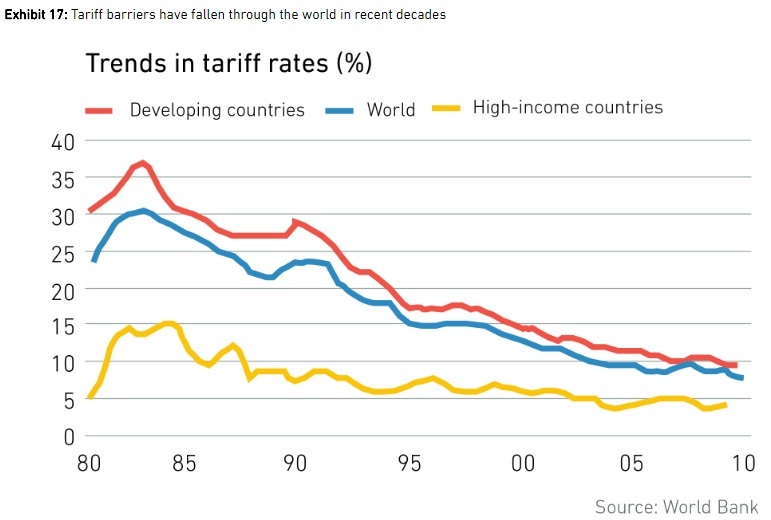 If based on mutual recognition, such a free trade agreement should reverse the unfortunate trend of deals getting saddled with extraneous and/or harmful provisions. And explain that FTAs based on mutual recognition produce an added benefit. This approach respects national sovereignty and also would have the added benefit of encouraging policy competition between nations. If either the U.S. or the U.K. was over-regulating in a certain sector, it would mean a loss of sales to the other country, which surely would create pressure for regulatory relief. Very similar to the way tax competition puts pressure on governments today not to impose excessive tax rates. By the way, we also shouldn’t have regulatory harmonization since that increases systemic fragility. In other words, it’s not a good idea to put all your eggs in one basket. Let’s close with a picture that powerfully captures what’s wrong with the current approach to free trade agreements. Does anybody think the new Singapore-E.U. pact is really about unfettered commerce? Looks to me like it’s really about politicians and bureaucrats micro-managing economic activity. Sort of like my version of a tax system compared to the mess we have now. P.S. It goes without saying, but I’ll say it anyhow, that Switzerland should be high on the list for a pro-market FTA with the United States. I’ve previously written about the bizarre attack that the European Commission has launched against Ireland’s tax policy. The bureaucrats in Brussels have concocted a strange theory that Ireland’s pro-growth tax system provides “state aid” to companies like Apple (in other words, if you tax at a low rate, that’s somehow akin to giving handouts to a company, at least if you start with the assumption that all income belongs to government). This has produced two types of reactions. On the left, the knee-jerk instinct is that governments should grab more money from corporations, though they sometimes quibble over how to divvy up the spoils. Senator Elizabeth Warren, for instance, predictably tells readers of the New York Times that Congress should squeeze more money out of the business community. Now that they are feeling the sting from foreign tax crackdowns, giant corporations and their Washington lobbyists are pressing Congress to cut them a new sweetheart deal here at home. But instead of bailing out the tax dodgers under the guise of tax reform, Congress should seize this moment to…repair our broken corporate tax code. …Congress should increase the share of government revenue generated from taxes on big corporations — permanently. In the 1950s, corporations contributed about $3 out of every $10 in federal revenue. Today they contribute $1 out of every $10. As part of her goal to triple the tax burden of companies, she also wants to adopt full and immediate worldwide taxation. What she apparently doesn’t understand (and there’s a lot she doesn’t understand) is that Washington may be capable of imposing bad laws on U.S.-domiciled companies, but it has rather limited power to impose bad rules on foreign-domiciled firms. So the main long-run impact of a more onerous corporate tax system in America will be a big competitive advantage for companies from other nations. The reaction from Jacob Lew, America’s Treasury Secretary, is similarly disappointing. He criticizes the European Commission, but for the wrong reasons. Here’s some of what he wrote for the Wall Street Journal, starting with some obvious complaints. …the commission’s novel approach to its investigations seeks to impose unfair retroactive penalties, is contrary to well established legal principles, calls into question the tax rules of individual countries, and threatens to undermine the overall business climate in Europe. But his solutions would make the system even worse. He starts by embracing the OECD’s BEPS initiative, which is largely designed to seize more money from US multinational firms. …we have made considerable progress toward combating corporate tax avoidance by working with our international partners through what is known as the Base Erosion and Profit Shifting (BEPS) project, agreed to by the Group of 20 and the 35 member Organization for Economic Cooperation and Development. He then regurgitates the President’s plan to replace deferral with worldwide taxation. …the president’s plan directly addresses the problem of U.S. multinational corporations parking income overseas to avoid U.S. taxes. The plan would make this practice impossible by imposing a minimum tax on foreign income. In other words, his “solution” to the European Commission’s money grab against Apple is to have the IRS grab the money instead. Needless to say, if you’re a gazelle, you probably don’t care whether you’re in danger because of hyenas or jackals, and that’s how multinational companies presumably perceive this squabble between US tax collectors and European tax collectors. On the other side of the issue, critics of the European Commission’s tax raid don’t seem overflowing with sympathy for Apple. Instead, they are primarily worried about the long-run implications. Veronique de Rugy of the Mercatus Center offers some wise insight on this topic, both with regards to the actions of the European Commission and also with regards to Treasury Secretary Lew’s backward thinking. Here’s what she wrote about the never-ending war against tax competition in Brussels. At the core of the retroactive penalty is the bizarre belief on the part of the European Commission that low taxes are subsidies. It stems from a leftist notion that the government has a claim on most of our income. It is also the next step in the EU’s fight against tax competition since, as we know, tax competition punishes countries with bad tax systems for the benefit of countries with good ones. The EU hates tax competition and instead wants to rig the system to give good grades to the high-tax nations of Europe and punish low-tax jurisdictions. And she also points out that Treasury Secretary Lew (a oleaginous cronyist) is no friend of American business because of his embrace of worldwide taxation and BEPS. …as Lew’s op-ed demonstrates, …they would rather be the ones grabbing that money through the U.S.’s punishing high-rate worldwide-corporate-income-tax system. …In other words, the more the EU grabs, the less is left for Uncle Sam to feed on. …And, as expected, Lew’s alternative solution for avoidance isn’t a large reduction of the corporate rate and a shift to a territorial tax system. His solution is a worldwide tax cartel… The OECD’s BEPS project is designed to increase corporate tax burdens and will clearly disadvantage U.S. companies. The underlying assumption behind BEPS is that governments aren’t seizing enough revenue from multinational companies. The OECD makes the case, as it did with individuals, that it is “illegitimate,” as opposed to illegal, for businesses to legally shift economic activity to jurisdictions that have favorable tax laws. John O’Sullivan, writing for National Review, echoes Veronique’s point about tax competition and notes that elimination of competition between governments is the real goal of the European Commission. …there is one form of European competition to which Ms. Vestager, like the entire Commission, is firmly opposed — and that is tax competition. Classifying lower taxes as a form of state aid is the first step in whittling down the rule that excludes taxation policy from the control of Brussels. It won’t be the last. Brussels wants to reduce (and eventually to eliminate) what it calls “harmful tax competition” (i.e., tax competition), which is currently the preserve of national governments. …Ms. Vestager’s move against Apple is thus a first step to extend control of tax policy by Brussels across Europe. Not only is this a threat to European taxpayers much poorer than Apple, but it also promises to decide the future of Europe in a perverse way. Is Europe to be a cartel of governments? Or a market of governments? A cartel is a group of economic actors who get together to agree on a common price for their services — almost always a higher price than the market would set. The price of government is the mix of tax and regulation; both extract resources from taxpayers to finance the purposes of government. Brussels has already established control of regulations Europe-wide via regulatory “harmonization.” It would now like to do the same for taxes. That would make the EU a fully-fledged cartel of governments. Its price would rise without limit. Holman Jenkins of the Wall Street Journal offers some sound analysis, starting with his look at the real motives of various leftists. …attacking Apple is a politically handy way of disguising a challenge to the tax policies of an EU member state, namely Ireland. …Sen. Chuck Schumer calls the EU tax ruling a “cheap money grab,” and he’s an expert in such matters. The sight of Treasury Secretary Jack Lew leaping to the defense of an American company when in the grips of a bureaucratic shakedown, you will have no trouble guessing, is explained by the fact that it’s another government doing the shaking down. And he adds his warning about this fight really being about tax competition versus tax harmonization. Tax harmonization is a final refuge of those committed to defending Europe’s stagnant social model. Even Ms. Vestager’s antitrust agency is jumping in, though the goal here oddly is to eliminate competition among jurisdictions in tax policy, so governments everywhere can impose inefficient, costly tax regimes without the check and balance that comes from businesses being able to pick up and move to another jurisdiction. In a harmonized world, of course, a check would remain in the form of jobs not created, incomes not generated, investment not made. But Europe has been wiling to live with the harmony of permanent recession. Even the Economist, which usually reflects establishment thinking, argues that the European Commission has gone overboard. …in tilting at Apple the commission is creating uncertainty among businesses, undermining the sovereignty of Europe’s member states and breaking ranks with America, home to the tech giant… Curbing tax gymnastics is a laudable aim. But the commission is setting about it in the most counterproductive way possible. It says Apple’s arrangements with Ireland, which resulted in low-single-digit tax rates, amounted to preferential treatment, thereby violating the EU’s state-aid rules. Making this case involved some creative thinking. The commission relied on an expansive interpretation of the “transfer-pricing” principle that governs the price at which a multinational’s units trade with each other. Having shifted the goalposts in this way, the commission then applied its new thinking to deals first struck 25 years ago. Seeking a silver lining to this dark cloud, the Economist speculates whether the EC tax raid might force American politicians to fix the huge warts in the corporate tax system. Some see a bright side. …the realisation that European politicians might gain at their expense could, optimists say, at last spur American policymakers to reform their barmy tax code. American companies are driven to tax trickery by the combination of a high statutory tax rate (35%), a worldwide system of taxation, and provisions that allow firms to defer paying tax until profits are repatriated (resulting in more than $2 trillion of corporate cash being stashed abroad). Cutting the rate, taxing only profits made in America and ending deferral would encourage firms to bring money home—and greatly reduce the shenanigans that irk so many in Europe. Alas, it seems unlikely. But the main takeaway, as noted by de Rugy, O’Sullivan, and Jenkins, is that politicians want to upend the rules of global commerce to undermine and restrict tax competition. They realize that the long-run fiscal outlook of their countries is grim, but rather than fix the bad policies they’ve imposed, they want a system that will enable higher ever-higher tax burdens. In the long run, that leads to disaster, but politicians rarely think past the next election. P.S. To close on an upbeat point, Senator Rand Paul defends Apple from predatory politicians in the United States. The Foreign Account Tax Compliance Act (FATCA) arguably is the worst feature of the internal revenue code. It’s an odious example of fiscal imperialism that is based on a very bad policy agenda. But there is something even worse, a Multilateral Convention on Mutual Administrative Assistance in Tax Matters that has existed for decades but recently has been dangerously modified. MCMAATM is a clunky acronym, however, so let’s go with GATCA. That’s because this agreement, along with companion arrangements, would lead to a Global Tax Compliance Act. Or, as I’ve argued, it would be a nascent World Tax Organization. And the United States would be the biggest loser. That’s because FATCA was bad legislation that primarily imposed heavy costs on – and caused much angst in – the rest of the world. GATCA, by contrast, is an international pact that would impose especially heavy costs on the United States and threaten our status as the world’s biggest haven for investment. Let’s learn more about this bad idea, which will become binding on America if approved by the Senate. James Jatras explains this dangerous proposal in a column for Accounting Today. Treasury’s real agenda is…a so-called “Protocol amending the Multilateral Convention on Mutual Administrative Assistance in Tax Matters.” The Protocol, along with a follow-up “Competent Authority” agreement, is an initiative of the G20 and the Organization for Economic Cooperation and Development (OECD), with the support, unsurprisingly, of the Obama Administration. …the Protocol cannot be repaired. It is utterly inconsistent with any concept of American sovereignty or Americans’ constitutional protections. Ratification of the Protocol would mean acceptance by the United States as a treaty obligation of an international “common reporting standard,” which is essentially FATCA gone global—sometimes called GATCA. Ratifying the Protocol arguably would also provide Treasury with backdoor legal authority to issue regulations requiring FATCA-like reporting to foreign governments by U.S. domestic banks, credit unions, insurance companies, mutual funds, etc. This would mean billions of dollars in costs passed on to American taxpayers and consumers, as well as mandating the delivery of private data to authoritarian and corrupt governments, including China, Saudi Arabia, Mexico and Nigeria. The Foreign Relations Committee unfortunately has approved the GATCA Protocol. But Rand Paul, like Horatius at the bridge protecting Rome, is throwing sand in the gears and isn’t allowing easy passage by the full Senate. …the senator is right to insist that the OECD Protocol is dead on arrival. Taxpayers all over the world owe him their gratitude. In a column for Investor’s Business Daily, Veronique de Rugy of the Mercatus Center warns that this pernicious and risky global pact would give the IRS power to collect and automatically share massive amounts of our sensitive financial information with some of the world’s most corrupt, venal, and incompetent governments. During a visit to the World Bank this week, I got a sobering lesson about the degree to which the people working at international bureaucracies, including the Organization for Economic Cooperation and Development, dislike tax competition. For years, these organizations — which are funded with our hard-earned tax dollars — have bullied low-tax nations into changing their tax privacy laws so uncompetitive nations can track taxpayers and companies around the world. …they never tire of trying to raise taxes on everyone else. Take the Organization for Economic Cooperation and Development’s latest attempt to impose a one-size-fits-all system of “automatic information exchange” that would necessitate the complete evisceration of financial privacy around the world. A goal of the Convention on Mutual Administrative Assistance in Tax Matters is to impose a global network of data collection and dissemination to allow high-tax nations to double-tax and sometimes triple-tax economic activity worldwide. That would be a perfect tax harmonization scheme for politicians and a nightmare for taxpayers and the global economy. But she closes with the good news. Somehow the bureaucrats persuaded the lawmakers on the Senate Foreign Relations Committee to approve it. Thankfully, it’s currently being blocked by Sens. Rand Paul, R-Ky., and Mike Lee, R-Utah. Actually, all that’s being blocked is the ability to ram the Multilateral Convention through the Senate without any debate or discussion. John Gray explains the procedural issues in a piece for Conservative Review. Senators Rand Paul (R-KY) and Mike Lee (R-UT)…aren’t blocking these treaties at all. Instead, they are just objecting to the Senate ratifying them by “unanimous consent.” The Senate leadership has the authority to bring these tax treaties to the floor for full consideration – debate, amendments, and votes. That is what Senators Paul and Lee are asking for. …Unanimous consent means that the process takes all of about 10 seconds; there is no time to review the treaties, there is no time for debate, and not a second of time to offer amendments. They simply want them to be expedited through the Senate without transparency. …As sitting U.S. Senators, they have the right to ask for debate and amendments to these treaties. …These treaties are dangerous to our personal liberties. Senator Paul and Senator Lee deserve the transparency and debate they’ve requested. For those of us who want good tax policy, rejecting this pact is vital. An ideal fiscal system not only has a low rate, but also taxes income only one time and only taxes income earned inside national borders. Yet the OECD Protocol to the Multilateral Convention is based on the notion that there should be pervasive double taxation of income that is saved and invested, and that these taxes should be levied on an extraterritorial basis. For fans of the flat tax, national sales tax, or other proposals for tax reform, this would be a death knell. But this isn’t just a narrow issue of tax policy. On the broader issue of privacy and government power, Professor Niall Ferguson of Harvard makes some very strong points in a column for the South China Morning Post. I should be a paid-up supporter of the campaign to close down tax havens. I should be glad to see the back of 500-euro bills. …Nevertheless, I am deeply suspicious of the concerted effort to address all these problems in ways that markedly increase the power of states – and not just any states but specifically the world’s big states – at the expense of both small states and the individual. He cites two examples, starting with the intrusive plan in the U.K. to let anybody and everybody know the owners of property. The British government announced it will set up a publicly accessible register of beneficial owners (the individuals behind shell companies). In addition, offshore shell companies and other foreign entities that buy or own British property will henceforth be obliged to declare their owners in the new register. No doubt these measures will flush out or deter some villains. But there are perfectly legitimate reasons for a foreign national to want to own a property in Britain without having his or her name made public. Suppose you were an apostate from Islam threatened with death by jihadists, for example. …getting rid of bin Ladens is the thin end of a monetary wedge. …a number of economists…argue cash is an anachronism, heavily used in the black and grey economy, and easily replaced in an age of credit cards and electronic payments. But their motive is not just to shut down the mafia. It is also to increase the power of government. Without cash, no payment can be made without being recorded and potentially coming under official scrutiny. Without cash, central banks can much more easily impose negative interest rates, without fearing that bank customers may withdraw their money. He’s right. The slippery slope is real. Giving governments some power invariably means giving governments a lot of power. And that’s not a good idea if you’re a paranoid libertarian like me. But even if you have a more benign view of government, ask yourself if it’s a good idea to approve a global pact that is explicitly designed to help governments impose higher tax burdens? Senators Paul and Lee are not allowing eight treaties to go forward without open debate and discussion. Seven of those pacts are bilateral agreements that easily could be tweaked and approved. But the Protocol to the Multilateral Convention can’t be fixed. The only good outcome is defeat. Why Is the Obama Administration Allowing an International Bureaucracy to Push Tax Policies that Will Make America Companies Less Competitive? Most normal Americans have never heard of the “Base Erosion and Profit Shifting” project being pushed by the tax-loving bureaucrats at the Paris-based Organization for Economic Cooperation and Development. But in the world of tax policy, BEPS is suddenly attracting a lot of attention, mostly because the business community has figured out it’s a scheme that would require them to pay more money to greedy governments. I’m happy that BEPS is finally getting some hostile attention, but I wonder why it took so long. I started criticizing the project from the moment it was announced. Given the OECD’s dismal track record of promoting statist policy, there was zero chance that this project would result in good policy proposals. Though I will say that the Wall Street Journal quickly recognized that the BEPS scheme was a ruse for tax increases on the business community. And the editors of the paper have continued their criticisms as BEPS has morphed from bad concept to specific policy. Here are some passages from an editorial earlier this week. …the Organization for Economic Cooperation and Development this week released its final proposals for combatting “base erosion and profit shifting,” or BEPS. …The OECD claims governments lose anywhere between $100 billion and $240 billion in revenue each year to such legal strategies, and it has spent two years concocting complex rules and new compliance burdens to stop it. Perhaps the worst of the OECD’s ideas is…country-by-country reports to every jurisdiction in which a company operates would detail operations in that area, and where it has paid tax on any relevant profits. The WSJ is particularly concerned about proposals to require sharing of information with irresponsible and corrupt governments. Ostensibly this…data would be kept confidential. Fat chance about that, especially if a high-taxing government thinks it has spotted an opportunity to grab more revenue or indulge some political grandstanding. A related proposal would require companies to hand over their so-called master files to governments. Those files, which detail global operations and intra-company transfers, are essentially guides to proprietary business strategies. Passing them to the authorities, and especially governments that run state-owned enterprises competing with multinational firms, is an invitation to mischief. The OECD’s proposals also will mean higher compliance costs. Companies could also be forced to spend years in courts and arbitration challenging potential new instances of the double taxation the current global tax system was developed to avoid. …Underlying all of this is the belief that the fiscal problems of the world result from insufficient tax collection, when the real culprit is anemic growth. The final point in the above passage deserves special attention. Economic growth in many industrialized nations is relatively anemic because of bad government policy. And since people are earning less income and businesses are earning fewer profits, this means less revenue for government. But rather than fix the policies that are causing sub-par growth, the politicians want to impose higher tax rates. Needless to say, this will simply lead to less taxable income, making it even harder to collect revenue (this is the core insight of the Laffer Curve). It’s also worth citing what the Wall Street Journal wrote over the summer on the BEPS issue. The editors started with an important observation about companies being able to invest in high-tax nations because they can protect some of their profits. The global war on low tax rates entered a new stage… Hang onto your wallets—and your proprietary corporate data. …Governments have noticed that companies try to protect themselves from rapacious tax policies. …This is all legal for now, and a good thing too. Shielding profits from growth-killing taxes helps make investment and job creation in high-tax jurisdictions more economical. And the editorial also warns about the dangers of giving dodgy governments access to more information, particularly when some of them will be incapable of protecting data from hackers. The compliance burden these rules would impose counts as a new tax in itself. Despite some attempts to allow companies to file only one global disclosure in the jurisdiction of the corporate headquarters, in practice firms are likely to have to submit multiple, overlapping documents around the world. Sensitive corporate financial information would then be shared among global tax collectors. If you believe the OECD’s claim that all this will be kept confidential, have a chat with any of the millions of federal employees whose personnel files Uncle Sam allowed China to hack. By the way, I don’t doubt for one second that companies push the envelope as they try to protect their shareholders’ money from government. But less money for government is a good outcome. Particularly when politicians are imposing taxes – like the corporate income tax – that hurt workers by impeding capital investment. The main thing to understand, at least from an American perspective, is that businesses have a big incentive to shift money out of the United States because politicians have saddled our economy with the world’s highest corporate tax rate, combined with the globe’s most punitive worldwide tax system. Dealing with those problems is the right approach, not some money grab from an international bureaucracy. I shared these ideas in this brief presentation I made to an audience on Capitol Hill. For what it’s worth, the chart I shared is all the evidence you could ever want that governments aren’t suffering from a lack of corporate tax revenue. Moreover, while I don’t like OECD schemes to enable higher tax burdens, the BEPS project won’t equally affect all businesses. Let’s look at how the project specifically disadvantages American companies (above and beyond the self-imposed damage from Washington). Aparna Mathur of the American Enterprise Institute explains how BEPS will make a bad system even worse for US-based multinationals. The U.S. has much to lose from a shift to this system. …the U.S. today has the highest corporate tax rate in the OECD. Under BEPS, this would affect the real decisions of firms to locate jobs and capital investment in the U.S.. In a recent report Michael Mandel points out that the BEPS principles will give multinationals a strong incentive to move high-paying creative and research jobs out of the U.S. since that is the easiest way to take advantage of low tax rates. …The current U.S. system of corporate taxation has many flaws. …the changes envisaged under the OECD’s BEPS project would make matters even worse. Some people have complained about corporate inversions, but it doesn’t hurt America when a company technically redomiciles in a nation with better tax law. After all, the jobs, factories, and headquarters generally remain in the United States. 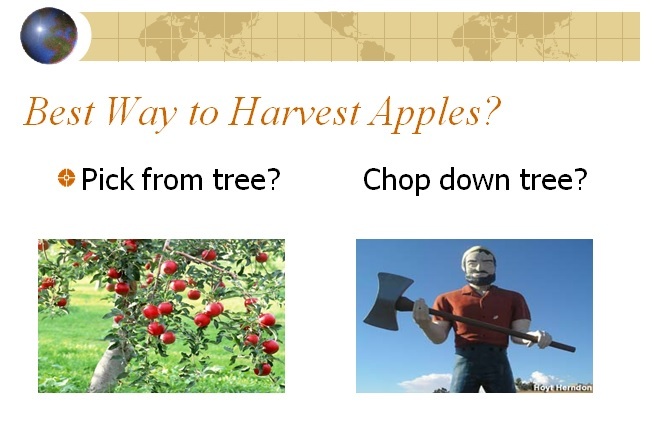 But the way BEPS is structured, companies will have to move economic activity out of America. Last but not least, Veronique de Rugy of the Mercatus Center identifies some major systematic flaws in the BEPS project. She starts by pointing out what the OECD wants. Europe’s largest welfare states…are leading the charge through the Organisation for Economic Co-operation and Development to raise corporate tax rates globally. …The underlying assumption behind the base erosion and profit shifting, or BEPS, project is that governments aren’t seizing enough revenue from multinational companies. …Its solution is to force those companies that wisely structured their operations to benefit from low-tax jurisdictions to declare more income in high-tax nations. And then she explains what will be the inevitable result of higher tax burdens. Far from filling government coffers in order to continue funding massive redistributive welfare regimes, BEPS will strangle global economic output and erode tax bases even further. …Corporations provide an easy political target for tax-hungry politicians, but the burden of corporate taxes falls on ordinary citizens. Employees, shareholders, and investors will bear the brunt of the OECD’s corporate tax grab, all because European politicians refuse to accept responsibility for building bigger governments than their economies can sustain. So what is the Obama White House doing to protect American companies from this global tax grab? The good news is that some folks from the Treasury Department have complained that the project is targeting U.S. multinationals. The bad news is that the minor grousing from the United States hasn’t had an impact. Not that we should be surprised. Because of a shared belief in statism, the Obama Administration has worked to expand the OECD’s power to push bad tax policy around the world. P.S. Since today’s topic is arcane yet important international tax issues, allow me to share an update on the horribly misguided FATCA law. As is so often the case, the op-ed page of the Wall Street Journal is the source of great wisdom. America is the only country that taxes citizens on their global earnings, and in 2010 Washington exacerbated that by passing the Foreign Account Tax Compliance Act, or Fatca. As this law comes into force, it is doing immense harm to…the 8.7 million U.S. citizens living abroad, who have essentially been declared guilty of financial crimes unless they can prove otherwise. …American leadership overseas, from volunteer organizations to the business world, has diminished. No one wants an American involved when their citizenship attracts a maze of rules, regulations, potential fines and criminal penalties. …It’s painful to witness the anguish of patriotic Americans as they contemplate giving up their U.S. citizenship, as record numbers have been doing. In 2014, 3,417 renounced their citizenship, a 266% increase over 2012, before Fatca came fully into effect. 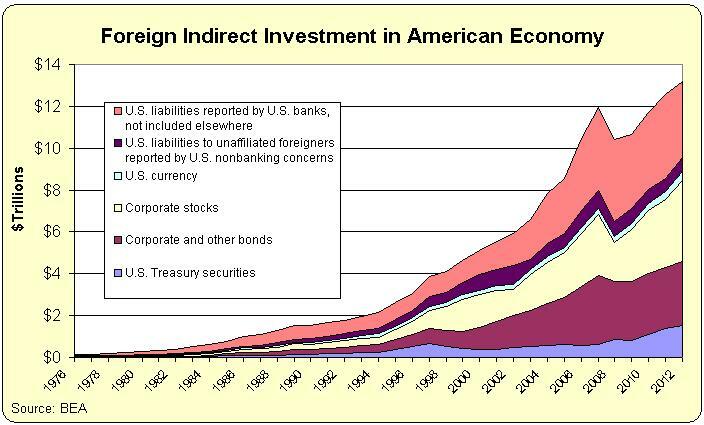 Interestingly, the way to solve the FATCA problem is the same way to deal with the corporate inversion issue. Simply shift to a territorial system. The best solution is for the U.S. to join the rest of the world in taxing based on residency rather than citizenship. …Doing so would advance American fairness, mobility and economic competitiveness. Sadly, only a handful of lawmakers, most notably Senator Rand Paul, are making noise on this issue. If you want to pinpoint the leading source of bad economic policy proposals, I would understand if someone suggested the Obama Administration. But looking to Europe might be even more accurate. And now there’s another really foolish idea percolating on the other side of the Atlantic Ocean. The U.K.-based Financial Times has a story about calls for greater European centralization from Italy. Italy’s finance minister has called for deeper eurozone integration in the aftermath of the Greek crisis, saying a move “straight towards political union” is the only way to ensure the survival of the common currency. …Italy and France have traditionally been among the most forceful backers of deeper European integration but other countries are sceptical about supporting a greater degree of political convergence. …Italy is calling for a wide set of measures — including the swift completion of banking union, the establishment of a common eurozone budget and the launch of a common unemployment insurance scheme — to reinforce the common currency. He said an elected eurozone parliament alongside the existing European Parliament and a European finance minister should also be considered. “To have a full-fledged economic and monetary union, you need a fiscal union and you need a fiscal policy,” Mr Padoan said. The United States has a monetary union and an economic union, yet our fiscal policy was very decentralized for much of our nation’s history. And Switzerland has a monetary and economic union, and its fiscal policy is still very decentralized. Heck, the evidence is very strong that decentralized fiscal systems lead to much better outcomes. 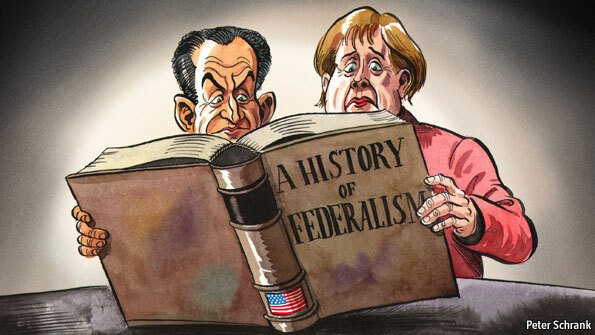 So why is Europe’s political elite so enamored with a fiscal union and so opposed to genuine federalism? There’s an ideological reason and a practical reason for this bias. The ideological reason is that statists strongly prefer one-size-fits-all systems because government has more power and there’s no jurisdictional competition (which they view as a “race to the bottom“). The practical reason is that politicians from the weaker European nations see a fiscal union as a way of getting more transfers and redistribution from nations such as Germany, Finland, and the Netherlands. In the case of Italy, both reasons probably apply. Government debt already is very high in Italy and growth is virtually nonexistent, so it’s presumably just a matter of time before the Italians will be looking for Greek-style bailouts. But the Italian political elite also has a statist ideological perspective. And the best evidence for that is the fact that Signore Padoan used to be a senior bureaucrat at the Paris-based OECD. The Italian finance minister…served as former chief economist of the OECD. You won’t be surprised to learn that French politicians also have been urging a supranational government for the eurozone. And presumably for the same reasons of ideology and self-interest. But here’s the man-bites-dog part of the story. The German government also seems open to the idea, as reported by the U.K.-based Independent. France and Germany have agreed a new plan for closer eurozone political union… The new Franco-German agreement would see closer cooperation between the 19 countries. Wow, don’t the politicians in Berlin know that a fiscal union is just a scheme to extract more money from German taxpayers?!? But maybe the Germans aren’t completely insane. Writing for Bloomberg, Leonid Bershidsky explains that the current German position is to have a supranational authority with the power to reject national budgets. 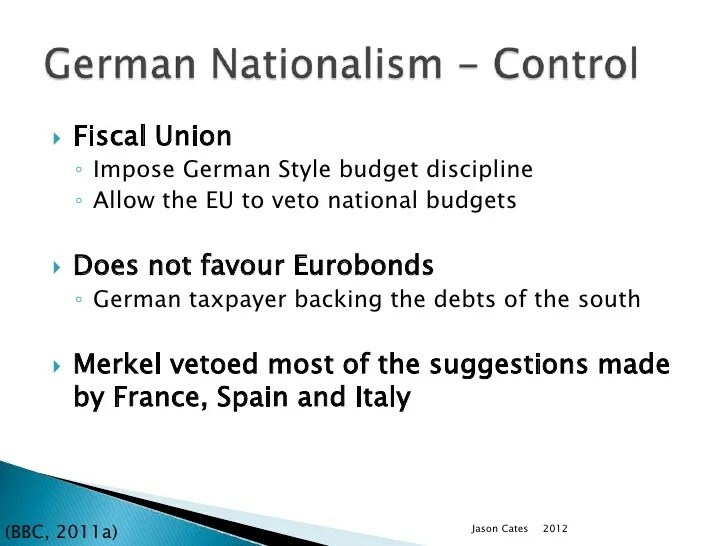 The German perspective on a political and fiscal union is a little more cautious. Last year, German Finance Minister Wolfgang Schaeuble and a fellow high-ranking member of the CDU party, Karl Lamers, called for a euro zone parliament (not elected, but comprising European Parliament members from euro area countries) and a budget commissioner with the power to reject national budgets if they contravene a certain set of rules agreed by euro members. And since the German approach is disliked by the Greeks, then it can’t be all bad. Former Greek finance minister Yanis Varoufakis, Schaeuble’s most eloquent hater, pointed out in a recent article for Germany’s Die Zeit that, in the Schaeuble-Lamers plan, the budget commissioner is endowed only with “negative” powers, while a true federation — like Germany itself — elects a parliament and a government to formulate positive policies. But “can’t be all bad” isn’t the same as good. Simply stated, any sort of eurozone government almost surely will morph over time into a transfer union. And that means more handouts, more subsidies, more harmonization, more bailouts, more centralization, and more bureaucracy. So you can see why Europe’s political elite may be even more foolish than their American counterparts. One would think that Europeans might finally be realizing that an ever-growing welfare state and an ever-rising tax burden are a form of economic suicide. The most obvious bit of evidence is to look at what’s happening in Greece. Simply stated, public policy for too long has punished workers and producers while rewarding looters and moochers. The result is economic collapse, bailouts, and the destruction of cultural capital. But Greece is just the tip of the iceberg. Many other European nations are heading in the same direction and it shows up in the economic data. Living standards are already considerably lower than they are in the United States. Yet instead of the “convergence” that’s assumed in conventional economic theory, the Europeans are falling further behind instead of catching up. There are some officials sounding the alarm. In a column for the Brussels Times, Philippe Legrain, the former economic adviser to the President of the European Commission, has a glum assessment of the European Union. In 2007, the EU accounted for 31 per cent of the world economy, measured at market prices. This year, it will account for only 22 per cent, according to the International Monetary Fund (IMF). Eight years ago, the EU’s economy was a fifth bigger than the US’s; this year it is set to be smaller than America’s. …Continued economic decline seems inevitable. But it seems that the folks who recognize that there is a problem are greatly out-numbered by those who want to make the problem worse. For instance, one would think that any sentient adult would understand that the overall burden of government spending in Europe is a problem, particularly outlays for redistribution programs that undermine incentives for productive behavior. Yet, as reported by the EU Observer, some statists at the European Commission want to mandate the amounts of redistribution in member nations. This is a horrible idea. It’s basically designed to impose a rule that forces nations to be more like France and Greece. Instead of competition, innovation, and diversity, Europe would move even further in the direction of one-size-fits-all centralization. Though I give her credit for admitting that the purpose of harmonization is to force more spending, what she calls “upper convergence.” So we can add Ms. Thyssen to our list of honest statists. And speaking of centralization, some politicians want to go beyond mandates and harmonization and also have EU-wide taxes and spending. Here are some of the details from a report in the U.K.-based Guardian. German and French politicians are calling for a…eurozone treasury equipped with a eurozone finance chief, single budget, tax-raising powers, pooled debt liabilities, a common monetary fund, and separate organisation and representation within the European parliament. …They call for the setting up of “an embryo euro area budget”, “a fiscal capacity over and above national budgets”, and harmonised corporate taxes across the bloc. The eurozone would be able to borrow on the markets against its budget, which would be financed from a kind of Tobin tax on financial transactions and also from part of the revenue from the new business tax regime. By the way, this initiative to impose another layer of taxes and spending in Europe isn’t being advocated by irrelevant back-bench politicians. It’s being pushed by Germany’s Vice Chancellor and France’s Economy Minister! Thankfully, not everyone in Europe is economically insane. Syed Kamall, a member of the European Parliament form the U.K.’s Conservative Party, is unimpressed with this vision of greater centralization, harmonization, and bureaucratization. Here’s some of what he wrote in a column for the EU Observer. Syed’s point about Europe not being the world is especially relevant because the damage of one-size-fits-all centralization manifests itself much faster when jobs and capital can simply migrate to other jurisdictions. And while the Europeans are trying to undermine the competitiveness of other nations with various tax harmonization schemes, that’s not going to arrest Europe’s decline. Simply stated, Europe is imposing bad policy internally at a much faster rate than it can impose bad policy externally. P.S. Let’s close with some humor sent to me by the Princess of the Levant. It features the libertarian character from Parks and Recreation. And I even found the YouTube clip of this scene. Which is definitely worth watching because of how Swanson explains the tax system. I particularly like the part about the capital gains tax. It’s a good way of illustrating double taxation. Over the years, I’ve shared some ridiculous arguments from our leftist friends. Paul Krugman, for instance, actually wrote that “scare stories” about government-run healthcare in the United Kingdom “are false.” Which means I get to recycle that absurd quote every time I share a new horror story about the failings of the British system. Pascal Saint-Amans is a bureaucrat at the Paris-based Organization for Economic Cooperation and Development. He has spent his entire life sucking at the public teat. After spending many years with the French tax authority, he shifted to the OECD in 2007 and now is in charge of the bureaucracy’s Centre for Tax Policy Administration. I don’t know why he made the shift, but perhaps he likes the fact that OECD bureaucrats get tax-free salaries, which nicely insulates him from having to deal with the negative consequences of the policies he advocates for folks in the private sector. Anyhow, Saint-Amans, acting on behalf of the uncompetitive nations that control the OECD, is trying to create one-size-fits-all rules for international taxation and he just wrote a column for the left-wing Huffington Post website. Let’s look at a few excerpts, starting with his stated goal. To regain the confidence and trust of our citizens, there is a pressing need for action. To this end, the OECD’s work…will pave the way for rehabilitating the global tax system. I’ve already explained that “exchange of information” is wrong, both because it forces low-tax jurisdictions to weaken their privacy laws so that high-tax governments can more easily double tax income that is saved and invested, and also because such a system necessitates the collection of personal financial data that could wind up in the hands of hackers, identity thieves, and – perhaps most worrisome – under the control of governments that are corrupt and/or venal. So let’s focus on the OECD’s “BEPS” plan, which is designed to deal with the supposed crisis of “massive revenue losses” caused by corporate tax planning. I explained back in March why the BEPS proposal was deeply flawed and warned that it will lead to “formula apportionment” for multinational firms. That’s a bit of jargon, but all you need to understand is that the OECD wants to rig the rules of international taxation so that high-tax nations such as France can tax income earned by companies in countries with better business tax systems, such as Ireland. In his column, Monsieur Saint-Amans tries to soothe the business community. He assures readers that he doesn’t want companies to pay more tax as a punishment. Instead, he wants us to believe his BEPS scheme is designed for the benefit of the business community. Naturally, the business community feels like it’s in the cross-hairs. …But the point of crafting new international tax rules is not to punish the business community. It is to even the playing field and ensure predictability and fairness. And maybe he’s right…at least in the sense that high tax rates will be “even” and “predictable” at very high rates all around the world if government succeed in destroying tax competition. You’re probably thinking that Saint-Amans has a lot of chutzpah for making such a claim, but that’s just one example of his surreal rhetoric. The OECD’s role is to help countries foster economic growth by creating such a predictable environment in which businesses can operate. I guess we’re supposed to believe that nations such as France grow the fastest and low-tax economies such as Hong Kong and Singapore are stagnant. Yeah, right. No wonder he doesn’t even try to offer any evidence to support his absurd claims. But I’ve saved the most absurd claim for last. He actually writes that a failure to confiscate more money from the business community could lead to less government spending – and he wants us to believe that this could further undermine prosperity! Additionally, in some countries the resulting lack of tax revenue leads to reduced public investment that could promote growth. Wow. I almost don’t know how to respond to this passage. Does he think government should be even bigger in France, where it already consumes 57 percent of the country’s economic output? Presumably he’s making an argument that the burden of government spending should be higher in all nations. If so, he’s ignoring research on the negative impact of excessive government spending from international bureaucracies such as the International Monetary Fund, World Bank, and European Central Bank. And since most of those organizations lean to the left, these results should be particularly persuasive. He’s also apparently unaware of the work of scholars from all over the world, including the United States, Finland, Australia, Sweden, Italy, Portugal, and the United Kingdom. Perhaps he should peruse the compelling data in this video, which includes a comparison of the United States and Europe. Not that I think it would matter. Saint-Amans is simply flunky for high-tax governments, and I imagine he’s willing to say and write ridiculous things to keep his sinecure. Let’s close by reviewing some analysis of the OECD’s BEPS scheme. The Wall Street Journal is correctly skeptical of the OECD’s anti-tax competition campaign. Here’s what the WSJ wrote this past July. …the world’s richest countries have hit upon a new idea that looks a lot like the old: International coordination to raise taxes on business. The Organization for Economic Cooperation and Development on Friday presented its action plan to combat what it calls “base erosion and profit shifting,” or BEPS. This is bureaucratese for not paying as much tax as government wishes you did. The plan bemoans the danger of “double non-taxation,” whatever that is, and even raises the specter of “global tax chaos” if this bogeyman called BEPS isn’t tamed. Don’t be fooled, because this is an attempt to limit corporate global tax competition and take more cash out of the private economy. P.S. High-tax nations have succeeded in eroding tax competition in the past five years. The politicians generally claimed that they simply wanted to better enforce existing law. Some of them even said they would like to lower tax rates if they collected more revenue. So what did they do once taxpayers had fewer escape options? As you can probably guess, they raised personal income tax rates and increased value-added tax burdens. P.P.S. If you want more evidence of the OECD’s ideological mission. It has allied itself with the nutjobs from the so-called Occupy movement to push for bigger government and higher taxes. The OECD is pushing a “Multilateral Convention” that is designed to become something akin to a World Tax Organization, with the power to persecute nations with free-market tax policy. The OECD advocates the value-added tax based on the absurd notion that increasing the burden of government is good for growth and employment. It even concocts dishonest poverty numbers to advocate more redistribution in the United States. P.P.P.S. I should take this opportunity to admit that Monsieur Saint-Amans probably could get a job in the private sector. His predecessor, for instance, got a lucrative job with a big accounting firm, presumably because “he had ‘value’ to the private sector only because of his insider connections with tax authorities in member nations.” See, it’s very lucrative to be a member of the parasite class.